Commercial fishing is an important component of the Mid-Atlantic’s economy and culture. It is a way of life for many who pursue it, not just a way of making a living, and shapes the identity and economies of numerous coastal communities. In 2012 (the most recent data available), commercial fishermen in the region landed 751 million pounds of seafood with a value of approximately $600 million, and the Mid-Atlantic seafood industry generated $18 billion in sales (NOEP 2015). In addition, commercial fisheries have many indirect positive impacts on the surrounding community and the supporting industries such as restaurants and ice houses (MAFMC). Domestic fisheries contribute about 2.5 billion to the Mid-Atlantic region’s economy (MAFMC). 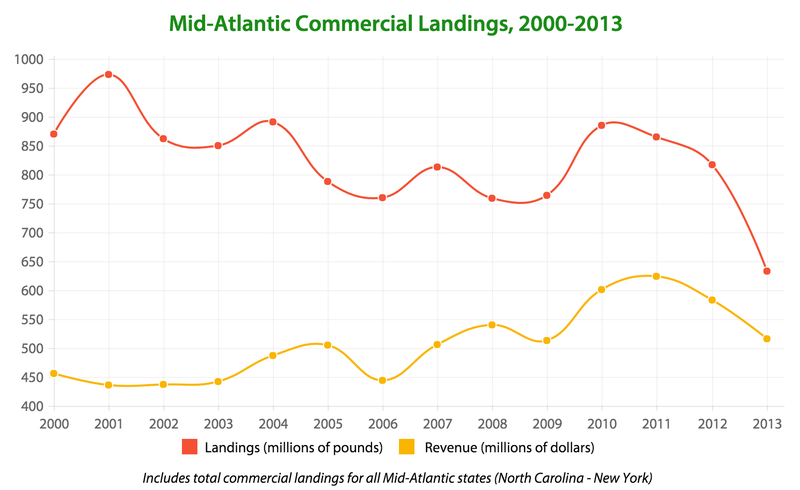 A compilation of over a decade of landings and revenue data from the Mid-Atlantic Fishery Management Council shows that landings have fluctuated around about 800 million pounds landed per year, with a decreasing trend since 2010 (see Figure; note these data include North Carolina). This graph also shows that commercial revenue does not always follow the same pattern as commercial landings in the region. For example, although 2013 represented the lowest landings in the time series, that year brought in the fourth highest revenue. 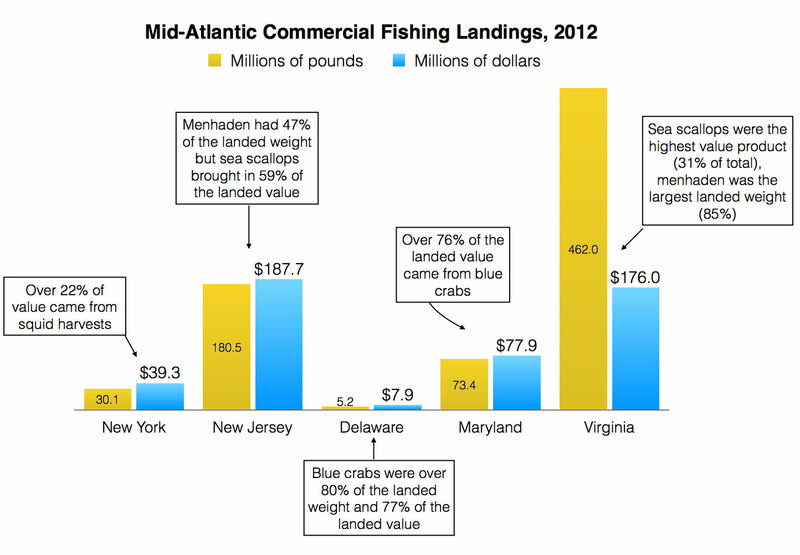 In an examination of 2012 data, the importance of particular fish species tended to differ among all of the Mid-Atlantic states (see figure below), but squid, menhaden, sea scallops and blue crab were all major contributors to Mid-Atlantic commercial fish landings. Commercial fishermen use a variety of vessels and gear types in the region, including bottom trawls, dredges and pots, and often harvest multiple types of fish and shellfish. To be successful, they must understand weather patterns and environmental conditions, and how these might affect the fish. In addition, many commercial fishermen own their own businesses, and so must spend time making sure permits and licenses are up to date, maintaining gear, and finding dealers or processors (MAFMC). 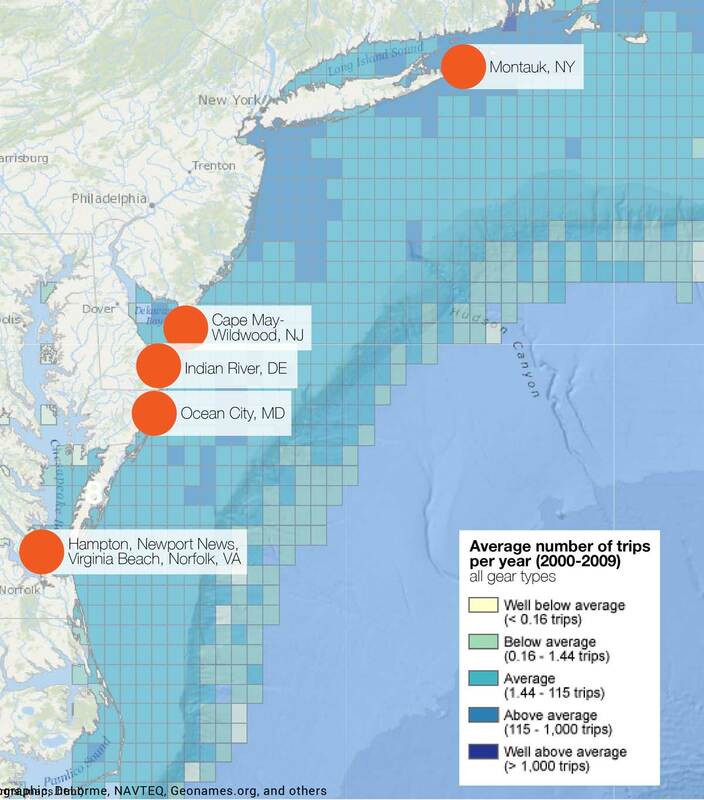 Commercial fishing vessels are based out of almost every Mid-Atlantic port. Data from Vessel Trip Reports, Vessel Monitoring Systems, and the Communities at Sea approach reveal the distribution and importance of fishing activity in the region. Seafood processing includes activities that convert landed fish and shellfish into fresh, canned, cured, and frozen seafood products. Seafood sales and processing contributed over $983 million toward the ocean economy of the region in 2012; data were not available for processing in Delaware or sales in Maryland (NOEP 2015). Seafood processing in the Mid-Atlantic region is concentrated in Virginia, with 37 establishments, and New York, with 22 establishments (NOEP 2015). Seafood sales in the region are concentrated in New York (398 establishments) and New Jersey (131 establishments) (NOEP 2015). Recreational fishing is a popular pastime and a significant economic driver in the region. Between 2003 and 2012, an average of 2.8 million anglers fished in the Mid-Atlantic region annually (NOAA-OST 2012). In 2009, approximately 42,000 people were employed in the recreational fishing industry, with an income impact of nearly $3 billion (MAFMC). Recreational fishing also stimulates other coastal industries by attracting tourists to the coast. Non-residents spent a total of $211 million on fishing trips and related expenses in 2012, including private boat charters (NOAA-OST 2012). In 2012, 92 percent of regional recreational anglers were Mid-Atlantic coastal county residents (NOAA-OST 2012). Approximately half of all fishing trips occurred on private or rental boats, while shore-based fishing represented about 40 percent of all fishing trips (NOAA-OST 2012). 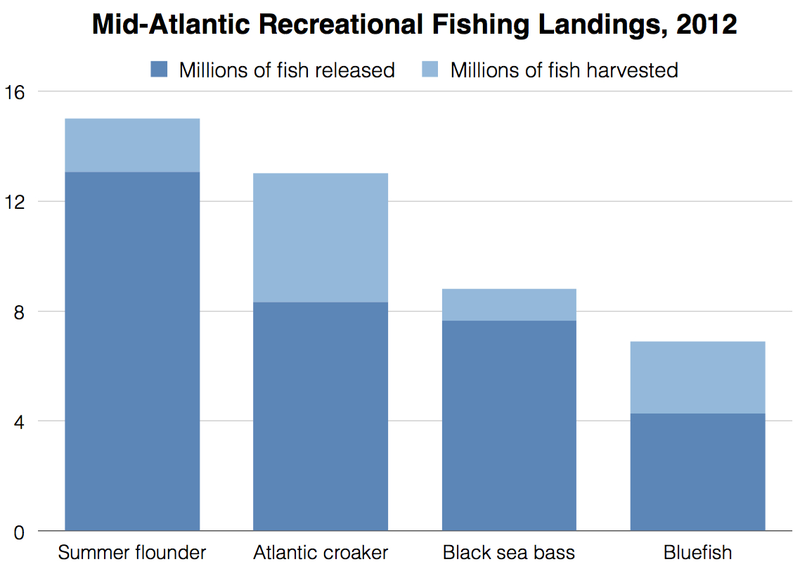 The most often-caught recreational species in 2012 in the Mid-Atlantic include summer flounder, Atlantic croaker, black sea bass, and bluefish. Between 2003 and 2012, summer flounder was the most commonly caught species, averaging 20 million fish caught per year over this time, and of which 88 percent were released rather than kept (NOAA-OST 2012). The states manage all fishing that occurs from the shoreline to a distance of 3 nautical miles offshore. For species that are caught primarily in state waters, the Atlantic States Marine Fisheries Commission coordinates regulations among the states and with the federal government. From 3 to 200 nautical miles offshore, NOAA’s National Marine Fisheries Service regulates fishing based on recommendations from the Mid-Atlantic Fishery Management Council. The Mid-Atlantic is the only region in the country that has no stocks that are overfished or undergoing overfishing.